What is the MET Gala & what is the theme for 2018? | HELLO! 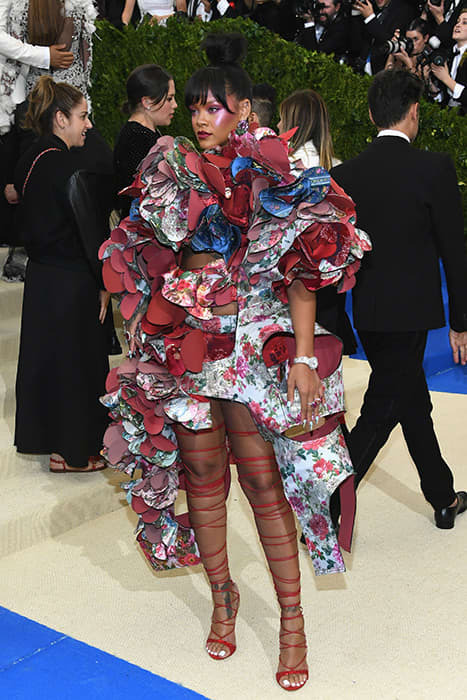 It's that time of year again, when top names from fashion and the arts don glamorous dresses for New York's distinguished Met Gala. We've seen all kinds of weird and wonderful outfits over the years at this event, from Sarah Jessica Parker's one-shouldered tartan look to Beyoncé's naked dress and Rihanna's vast yellow gown. And who could forget Madonna's daring sheer outfit exposing her derriere? Part of the excitement is seeing what the stars show up in for the society event of the season, which has a different dress code every year. But what exactly is the Met Gala and what is this year's theme? The Met Gala benefit was first founded by a publicist named Eleanor Lambert back in 1948 and it's still going strong today – unlike the Oscars and the Grammy Awards, this isn't an awards event, rather a charity benefit to raise funds for the Metropolitan Museum of Art Costume Institute. The occasion celebrates the opening of the museum's latest fashion exhibition and this year three locations will be used: the Met galleries, the Anna Wintour Costume Centre and the Met Cloisters branch of the museum. Last year a ticket cost $30,000, so it's not a cheap night out. All proceeds go to the Costume Institute. US Vogue editor Anna Wintour is chairwoman of the gala and she oversees the invites. The evening used to be a more low key benefit but since Anna took over in 1995, it has become the style event of the year. Every year sees new honorary chairs at the event, from fashion designers to A-listers. This year it's the turn of Rihanna, Donatella Versace and Amal Clooney. The event is held on the first Monday of May, commencing at 7pm New York time which is 12am in the UK. The order of the night involves a cocktail reception and dinner with live performances. You can always count on the Met Gala for a fabulous theme. Previous years have featured 'China: Through the Looking Glass', 'Manus x Machina: Fashion In An Age Of Technology' and 'Rei Kawakubo/Comme des Garçons: Art of the In-Between'. This year the theme is 'Heavenly Bodies: Fashion and the Catholic Imagination' in reference to the religious artwork in the museum. People think this could be the most controversial theme yet, so we can't wait to see what the stars come up with for this. It's a super formal affair – even photographers have to wear black tie. The event really is a favourite amongst the stars. Rihanna has been to the Met Gala a huge seven times since 2007, while Donatella Versace is the queen of the ball – she's notched up 16 appearances at the benefit since 1995. The Met Gala really is a who's who of fashion and the arts. It's more like, who isn't going. Anna Wintour will obviously be there, along with fellow hosts Rihanna, Donatella Versace and Amal Clooney. Kim Kardashian recently revealed she's going and SJP is a regular on the red carpet. The big question is whether Beyonce will return to the Met Gala this year, after a year off to have her twins. You can catch all the action on E! 's Live From the Red Carpet show from 11pm till 2am UK time. Of course, you can keep a close eye on celebs' Insta and Twitter accounts for their own Met Gala snaps. Enjoy the show!